If the quality of the box art is proportional to the figures' quality, then you know what to expect in the next lines of this review. The first image is not bad although it seems ancient and is not very appealing ,and the second one (the one I bought) you have to be 5 minutes guessing what you are really buying, only to find out that it is impossible if you don't open the box, adding to it that it was just a sloppy printed ordinary paper glued with paper glue, I don't know why I really bought them. I am sorry that the image isn't good enough, hope the painted pics at the bottom can give you a better idea. 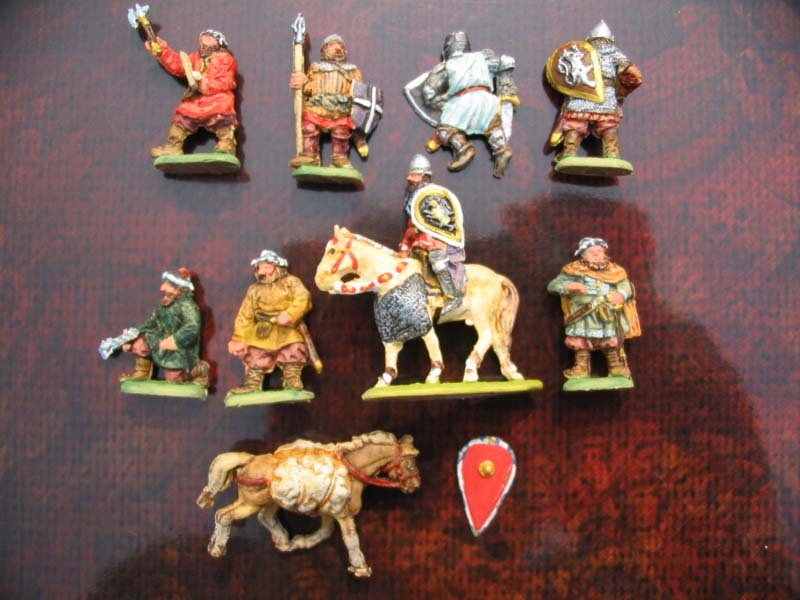 These are a sort of Strelets wargaming figures, very stubby and quite fat. But these also have huge long noses (yes, it isn't a typo, I have said noses!). All the same you could say that they are better than the worst Strelets sets, because at least they retain the proportions (more or less). Another curiosity, is that this set is directly (and without any doubt) copying two poses, concretely the horses, because the first is a Esci horse modified with a bit of armour, which makes the rider seem gigantic and is actually taller than the horse! 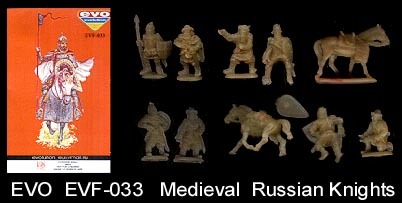 and a Zvezda Mongol horse with two added sacks (and without the stand, and they don't stand on their own, so you either glue them to a diorama or you have to make the stand yourself ), which seem to carry either potatoes (historically inaccurate) or rocks. Well, I suppose they could be apples too. You are given three separate weapons, which are not really adequate - here nearly everybody will throw them directly to the rubbish, I have reused some, but better be preparing some spare spears. All the poses are not in combat situations, just the 3 foot men without weapons- you could say they are "prepared" to fight, albeit if in defensive situation. The other ones are just marching, guarding or standing by, so this limits a lot what you can do with them. The historical accuracy here is at least very high, everything is right and you really cannot say much against. Maybe the design of the dead knight is a bit too western, but it is quite acceptable. 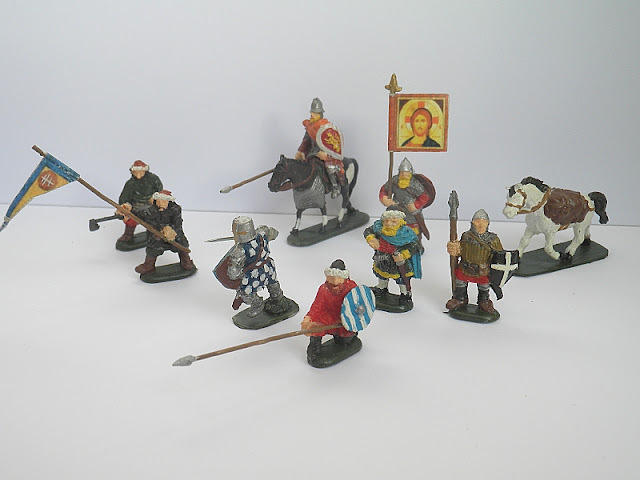 This set can be really only be used to represent eastern medieval kingdoms, Poland, Ukraine (as Metch sells them), the various Russian kingdoms (Vladimir-Suzhdal, Novgorod, etc) and maybe late Lithuanian. "I feel that many reviews are oblivious to this point - there are fantastic figures, which you can´t say anything against, but they are just too "correct", maybe too static, and just boring. So I feel that this is an important consideration when deciding if you buy this set"
Even if they have few poses, all the poses are very rigid, and you get very few men. 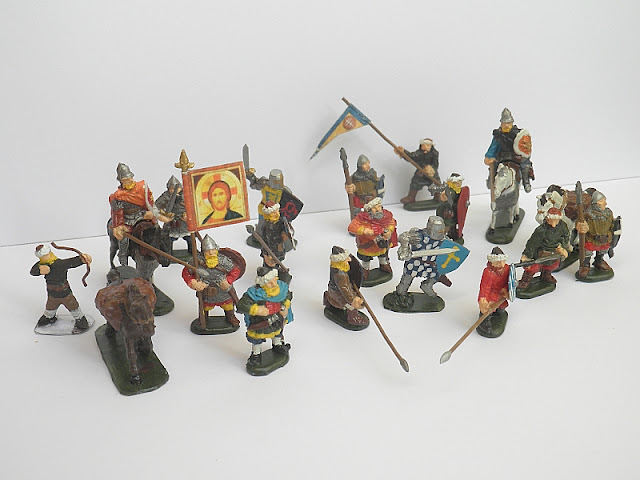 The funness of this set is its bizarreness (if this word exists ) ; the figures have quite a unique feeling to them, and the leaders have a lot of charisma, as of wealthy and important dukes or nobles. The Metch set includes some orthodox paper flags, and some typical Bum tents. The flags are useful, and you can give the tents to a more suitable army. Depending on which set you buy, you are given either 8 men (totally unacceptable quantity) or 16, which is a bit better considering you are given 4 horses (in the case of Metch). 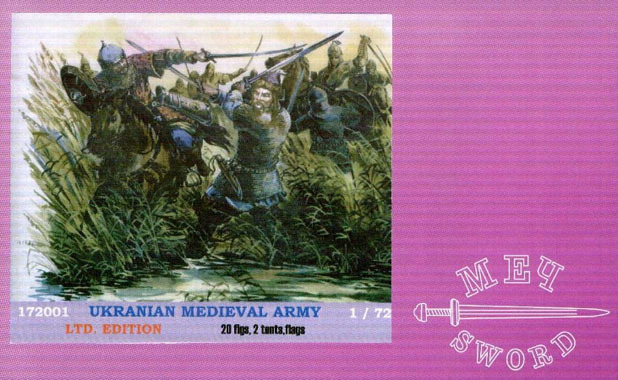 But if you are a wargamer, keep away from this set. 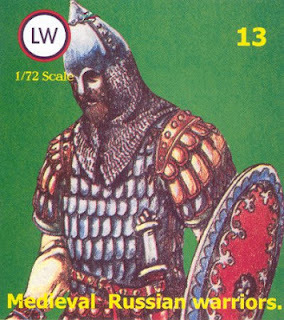 The only good thing is it will give you leaders and different men, and if you have all the sets for slavic medieval armies, it can come in handy just for the sake of variety. 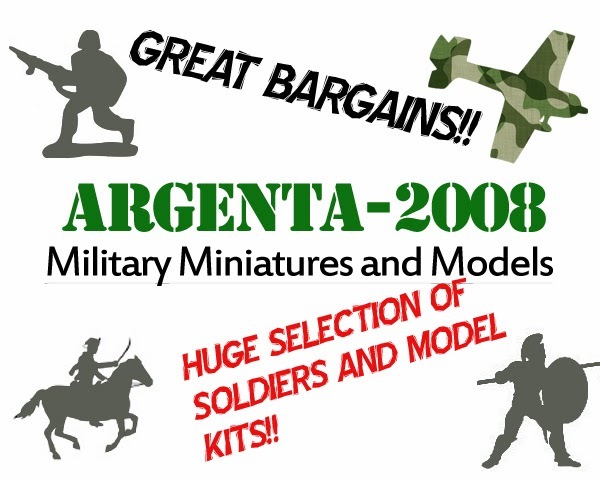 "The price value ratio of this soldiers will vary between every shop you go to, and the best I can do is judge by their average price on eBay"
In this case, these are some of the rarest sets you can try to own. 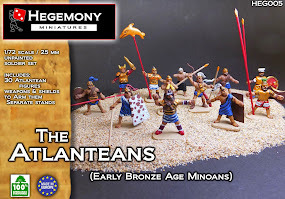 They aren't sold by eBay (at least at the moment, but as usual, you can always try to search), though god help you if you want to get hold of them. 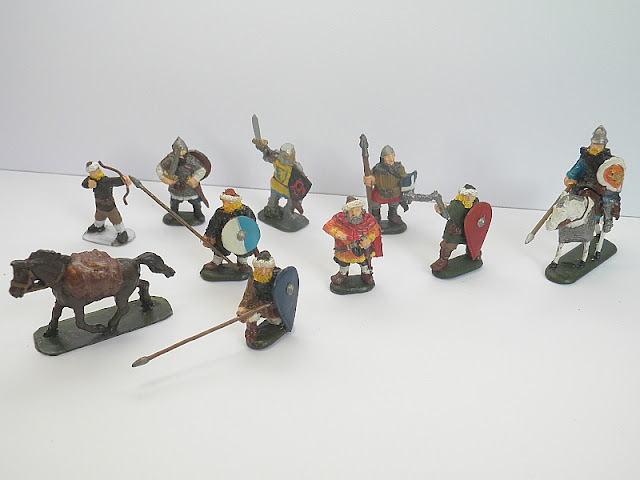 I paid in a retail shop 11,95 €, which was a bad purchase in all senses (I might have a super rarity now, but at that moment I just had 16 very expensive fat miniatures). The plastic is a bit slippery, and it glues very badly ( but which you will probably need to d). The only good thing is the detail is sharp and you see what you paint. They might score very low in many, many aspects, and now they are not the only Ukrainian Medieval men, but their weirdness makes them special. If you can get them (the 16 figure Metch set) at a reasonable price by all means do it, but that wouldn't be more than 4 or 5 €. These figures have been painted and modified by myself. I have given spears to the soldiers. To make them more natural, I used some of the flags originally given by Metch , and I have also made some shields and stands for the cargo horses.